DESCRIPTION WindLimits shows you all wind limitations for take-of, landing and Autoland approaches incl. braking action and braking coefficient for your aircraft. FUNCTION First, the black arrow has to be turned to the CRS of the actual runway. Second, a colored annulus has to be selected according to the „type of approach“ and/or the reported runway condition. 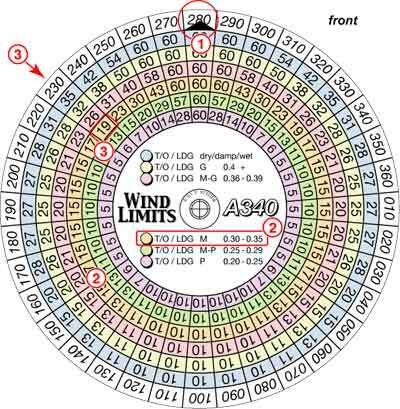 Third, the actual windreport can be compared directly with the maximum wind value (shown on the selected, colored annulus) and enables to find out whether all limitations for head-, cross- and tailwind are within aircraft limits or not. 4. A/C limit exceeded: max 19 kts from 230°!